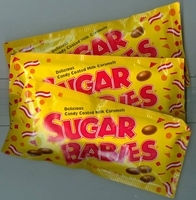 Sugar babies a popular nostalgic candy from the 50's. A delicious candy coated milk caramels very similar to the sugar daddy candy. 6 1.7oz bags per package. Sugar babies were named after the song "Let Me Be Your Sugar Baby". These classic candies were first introduced to the market in 1935. 6 1.7oz bags per package.